Looking around the industry over the last few weeks, there continues to be a flood of innovation that promises new approaches for unmanned aircraft in addressing several new opportunities. This month I cover a flying taxi at the 2019 Consumer Electronics Show (CES) in Las Vegas, greater range for multi-copters using fuel cells, a potential huge drone in the making, and a potential Florida controversy over use of a tethered aerostat — interesting stuff! At CES of all places, there was a new idea for air-taxis — not yet a UAV, but with the promise of future autonomous flight, it surely deserves a mention. Bell brought its latest commercial vertical take-off and landing (VTOL) mock-up to CES to test the level of interest in its concept of a flying car. Lift and directional flight control are provided by six 8-foot ducted fans, each driven by its own electric motor and powered by a turbine-driven electric generation and back-up battery system. Using technology derived from the mil-spec V-22 Osprey Tilt-Rotor and its commercial V-280 cousin, the ducted fans pivot from horizontal for take-off to vertical for forward flight. The concept vehicle at CES had a seat for the pilot, but the digital flight control system is envisaged to have autonomous flight capability — and there we have another approach for a UAV flying car/air-taxi — from one of the mainstay aviation manufacturers of helicopters with all the necessary experience to make it happen. There’s apparently a new way to overcome the short duration that is currently available for flying existing multi-rotor drones — don’t just rely on batteries, use hydrogen! Actually a hydrogen fuel-cell configuration that has recently been tested in the UK to extend flight time to 70 minutes, while carrying a 5-kg payload. 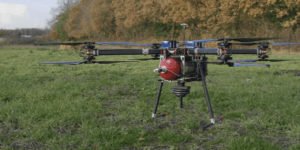 The UK team includes Intelligent Energy, which supplies the fuel-cell, engineering firm Productiv, and UAS video company BATCAM, with funding provided by Innovate UK, a government-sponsored group that supports novel ventures such as this joint project. Most existing battery-powered multi-rotor UAVs have endurance in the tens of minute (DJI seems to be approaching 20-30 minutes with some of its drone models). But longer endurance is really important for most operators, especially for capturing lengthy video, hence the interest and participation of BATCAM as the operator/consultant for the project. Fuel cells provide a number of advantages over batteries with fast refuel, little vibration, quiet operation, zero emission at point of use, and around three times longer flight time. Intelligent Energy is making use of a portable hydrogen refueling system supplied by NanoSUN. 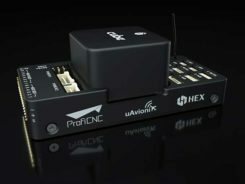 With BATCAM set to begin operational trials, the company is optimistic that further development of hydrogen fuel cells for UAVs will not only enable even longer video broadcasts but will solve the problem encountered with the difficult and expensive international transportation of Lithium polymer batteries. While we are in the UK, a huge 300-foot-long helium-filled airship called the Airlander 10 is again moving steadily down the path to gain civil approval by the Civil Aviation Authority (CAA), despite a previous crash in November 2017 due to a wayward landing cable. The latest milestone was just achieved at the end of 2018 when CAA awarded Hybrid Air Vehicles Ltd. (HAV) a Production Organisation Approval, following on from earlier Design Organisation Approval by the European Aviation Safety Agency (EASA) in October 2018. This behemoth airship is claimed to be the largest aircraft in the world, can carry 10 tons of cargo virtually anywhere on earth, stays airborne for up to five days, and can land almost anywhere. Powered by two forward-mounted rotating ducted fans and two aft fixed fans, all driven by diesel engines, the pressurized helium-filled envelope is 302 feet long, 143 feet wide, 85 feet tall, and has no internal support structures — all this with a cruise speed of up to 80 knots and a maximum altitude of 20,000 feet. The Airlander is aimed at bulk cargo transport, but could also handle communication and observation/reconnaissance roles in both the military and commercial sectors. And it’s not so far away from becoming the largest unmanned aircraft in the world, either, should things eventually turn in that direction. Could there be potential for a greater payload without the extensive provisions for a pilot, with lower operating costs, potentially greater range and speed and/or operational altitude? Miami police have been using a tethered aerostat to monitor large gatherings, such as the Dec. 28 Orange Bowl-related party called the Capital One Beach Bash. Presumably this use had a safety related motivation, and there was hopefully no intent to spy on partygoers. However, I just became aware that police cannot fly drones in Florida to surveil people — there’s a law against it. But there is a provision in the Florida “Freedom from Unwarranted Surveillance Act,” which starts off: “If the law enforcement agency possesses reasonable suspicion that, under particular circumstances, swift action is needed to prevent imminent danger to life or serious damage to property,…”. Now, I’m no lawyer, but it would seem that this exclusion might possibly allow the Miami cops to monitor large gatherings where there might be a need to watch out for people’s safety – that generally being what we employ the police to do for us. But the Florida lawmakers certainly believe that there is clearly a need to protect people’s privacy and to prevent unauthorized monitoring of an individual’s activities using drones. The provisions of Florida Statute 934.50 prohibits “the observation of such persons with sufficient visual clarity to be able to obtain information about their identity, habits, conduct, movements, or whereabouts” — a good thing to do to protect our freedom of movement and basic rights. But you have to ask yourself if a general prohibition on the use of drones by police is the best thing to do when other police departments around the U.S. are gaining advantages from drone usage by speeding up and improving the accuracy of traffic accident investigations, for search and rescue, in crime scene reconstruction, for disaster response, and of course for improving officer safety — in fact, all the things that are already achieved through the use of police helicopters, but at a fraction of the cost. Florida Statute 934.50 already has a significant number of allowable exceptions to enable a “law enforcement agency” and others to operate drones legally, but could it also be possible that these wider benefits of drone use might be fully exempted without infringing any personal liberties? To sum up, we have a big aerospace company jumping in to help shape the future of unmanned air taxis; another drone fuel-cell application that significantly extends flight time; and progress towards certification of an airship that has benefits as a drone. Finally, police use of a tethered aerostat at an event stirs potential controversy, while other police forces benefit from the use of drones — a mixed bag of drone ventures that seem to have great potential.